Like a shooting star, in a short period of time, Josh Groban went from a talented young vocalist ready to enter college to the crowned new prince of romantic music. With a best-selling debut album and highly rated PBS special, the successful combination of his classical crossover croon, boyish good looks, and association with überproducer David Foster Groban became an instant sensation. His sophomore studio release, Closer, stays safely within the lines of his debut collection as Foster once again helms a modest set of pseudo-classical pop songs performed dreamily in various languages. Listening to Groban, it is easy to see this young lion continuing to transform into a powerhouse male vocalist. His style continues to explore a mainstream pop genre rather than operatic material. It is my hope that he reaches a younger generation of blossoming male vocalist who may not be fully interested in Opera and who may want to pursue a more mainstream offshoot of vocal genres. On Closer we see the continued creation of Josh Groban with a more consistent presentation and skilled execution than his debut. His voice comfortably performs emotional European-inspired pop songs. 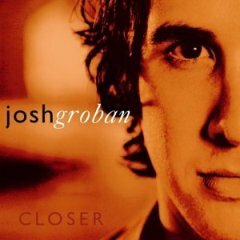 The true highlights of the disc are bookend with the esoteric opener, “Oceano,” which sets an ominous tone while the mysterious “Never Let Go” as a closer is a welcome collaboration with Deep Forest that allows Groban to successfully exhibit the many sides of his abilities as a vocalist. There is still plenty of romance included for the lovers. “When You Say You Love Me” resembles the emotion and angst exhibited by such greats as Celine Dion. Another cut that resembles the Celine vain is the Celtic-infused “You Raise Me Up” which cries with mournful passion and evokes the deepest emotions of love. Groban contributes a co-writing effort with Eric Mouquet on “Remember When it Rained,” that further shows that there is a future for him as a well rounded vocalist and composer. Groban is certainly a talent in the making. With depth and tone at his tender age, he’s potential for growth is limitless, certainly not to cast any shadow on how amazing he already is.